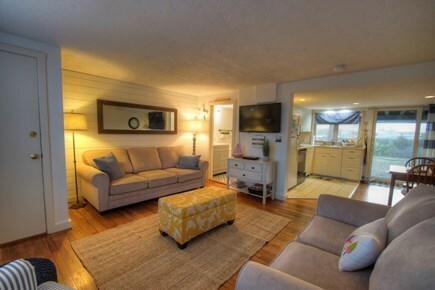 RENOVATED 2 Bedroom and 2 Bath Condo ON THE BEACH. 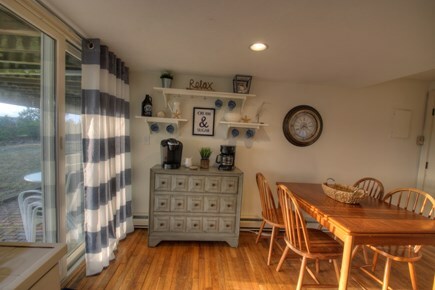 You can't be much closer to the beach with this RENOVATED beach front townhome which features two full levels (no lofts) with a family room on the first floor leading into the kitchen with a coffee bar. 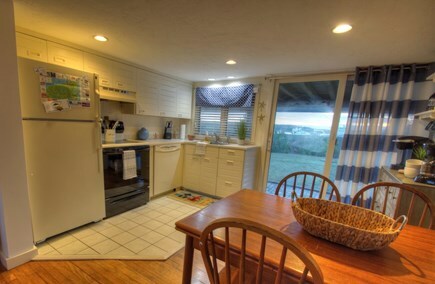 Off the kitchen is a back patio, picnic table and grill to cook and take in the water views. Upstairs, there are two bedrooms. 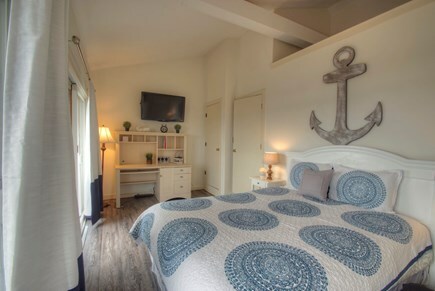 The back bedroom (#1) has a queen bed, desk with laptop friendly comfortable workspace, TV and DVD player with 2 sliding glass doors that lead to a beautiful deck facing the ocean, private beach and Outermost Harbor Marine with a table and chairs. 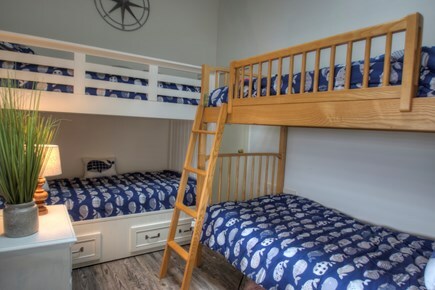 The front bedroom (#2) features a Pottery Barn bunk bed as well as a Vermont Tubbs bunk bed and has an ocean view and skylight to view the stars. 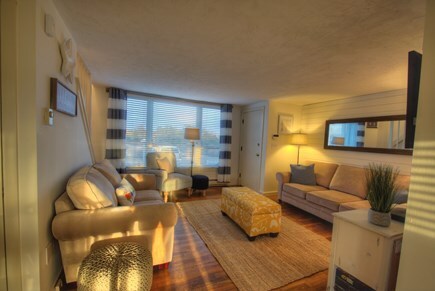 Very bright unit with water views, steps from a private beach, and an extremely family-friendly area. Condo also includes books/games/dvd's for additional family entertainment. 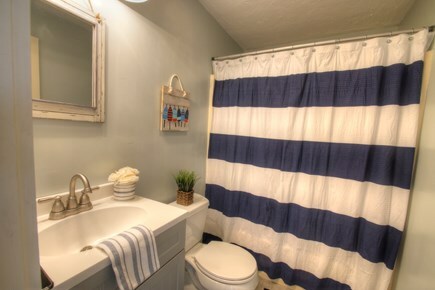 Private beach, back patio, private deck on 2nd floor, BBQ, Outermost Harbor Marine next door, Chatham Main Street and Chatham Lighthouse are walkable or a bike ride away. Free parking - 2 conveniently assigned spaces directly in front of Condo. Outdoor shower also on premises. This condo complex is one of the few beach front locations in Chatham with a private beach, a true water-view and family friendly area. 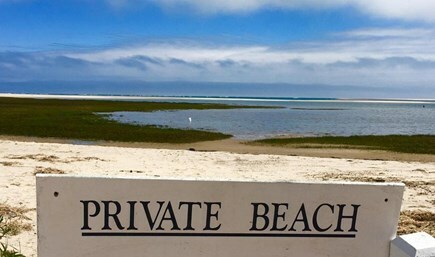 There is vast sand bar at low tide to walk, play or go clamming, a 10 min. walk over the dunes brings you to Light House Beach with plenty of seals to watch play in the waves. Chatham Main Street has endless activities, shops and places to eat. Chatham is in the middle of the Cape so you can discover all areas. 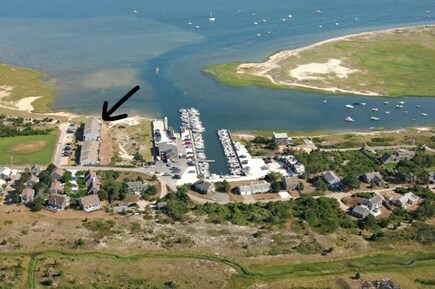 We are a 10 min drive from a ferry to Nantucket, 30 mins over to Hyannis or head up north to Provincetown. We have bike trails that span the entire Cape. There are buses. Chatham is very easy to get around on foot and via bike. Car needed for most other outings. Additional pricing info: Additional $175 cleaning fee per stay and $300 refundable security deposit required, State and local taxes of 12.45% will apply.